Zimbabwe is holding its first elections since the ouster of President Robert Mugabe. The main challenger to his ruling party is a candidate who was barely born at the beginning of Mugabe's rule. And all eyes are on one man in Zimbabwe. Nelson Chamisa is Zimbabwe’s opposition leader. He’s a lawyer and a pastor and in a country where lots has changed in the past eight months. As NPR’s Eyder Peralta reports, he has a chance to end 38 years of one-party rule. EYDER PERALTA, BYLINE: The rumor in Zimbabwe is that Nelson Chamisa is going to boycott the upcoming elections and that he feels the electoral commission is so corrupt, he cannot win. So why even try? So when he comes into the headquarters of his opposition party, he is met with a drove of journalists. NELSON CHAMISA: I’m used to addressing rallies but never a rally of journalists. PERALTA: In a country where Robert Mugabe ruled until he was 93 years old, Chamisa is stunningly young. He’s 40, baby face, a slender man. But he very quickly lets it be known he’s not dropping out. He’s not boycotting. He is fighting. CHAMISA: The people want us to defeat dictatorship, to defeat poverty, to defeat tyranny, to defeat their hopelessness. And this is why we are giving them a fighting chance. I can’t be written in history as a person who betrayed and deprived the people. PERALTA: Chamisa is running for president at a unique moment in Zimbabwe’s history. In November, Robert Mugabe was forced from office by his once vice president, Emmerson Mnangagwa. And the civic and political space has opened up. Zimbabweans have been able to express themselves, and the opposition has been able to campaign freely. So this very much feels like the opportunity of a lifetime to throw out the ruling party. Chamisa leans on the podium. He looks at the cameras and declares he will not let this election slip his hands. 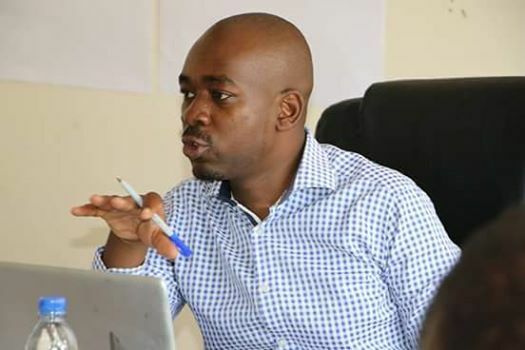 CHAMISA: If they rig or cheat, they will face the music – that they must know. It’s not a threat. It’s a good promise. PERALTA: It’s brazen, brave – the kind of statement that has made him a rock star. Nelson Chamisa wraps up the news conference, heads down the stairs where supporters have gathered spontaneously. UNIDENTIFIED CROWD #1: (Singing in foreign language). PERALTA: But how he came to lead the opposition is a source of much hurt. In February, Zimbabwe’s beloved opposition leader died. Chamisa said there wasn’t enough time to elect a new opposition leader. So he lobbied party leadership, and he was anointed the opposition candidate. Linda Masarira is an opposition stalwart. She’s dreamt of ousting the ruling party. And yet, she says, she won’t support Chamisa. LINDA MASARIRA: If one cannot follow a party constitution, how can we entrust him with the nation’s constitution? PERALTA: She says that she will support an independent candidate. As she sees it, Chamisa is hijacking the people’s struggle. MASARIRA: There are times when we have to use the voice of reason, rather than the voice of populism or desperation for change. UNIDENTIFIED CROWD #2: (Singing in foreign language). PERALTA: As the sun set, Chamisa makes his third campaign stop of the day, at a town outside Harare. Election day is Monday. The hope for change here is palpable. Thousands of people gather at a field to welcome Chamisa. Ruth Molana, a 50-something mother of two with two kids, can’t contain her excitement. RUTH MOLANA: (Foreign language spoken). PERALTA: She’s dancing. She’s singing in the middle of the crowd. She’s sick and tired of the old guard. She says she loves Chamisa because he’s young. Eyder Peralta, NPR News, Harare.